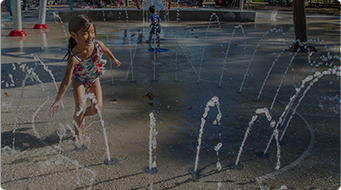 With more than 30 years experience, Aquatix has been a pioneer of experiential water feature and spray park design, fabrication and construction. In joining forces with Landscape Structures, our imaginative designs will continue to advance the world of dynamic water events – achieving new levels of chilling thrills, challenging interactive games and inventive water-based activities. The HydraHub1 at Crawford Aquatic Center in Dallas, Texas combines multiple interactive events, all on a raised platform. 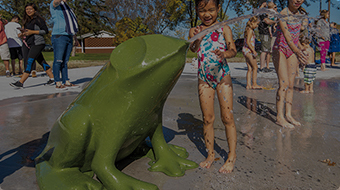 This outdoor pool offers tons of opportunity for splashes, spritzing and soaking amongst the VersoSplash™ dumping bucket, small bubblers, working telescope, multiple sprayers and more. We offer continuing education credits from the International Association for Continuous Education and Training (IACET) and the Landscape Architecture Continuing Education System™ (LA CES) to parks and recreation professionals and landscape architects.